Awesome card, love how you did the technique. Greats good. The paper, design, and photography really work. What a beautiful card! If only you could keep the shadows that fell so softly on it, it would retain such feeling! Great pic! Beautiful card and beautiful photography! I LOVE the letterpress look! You've photographed the card perfectly! 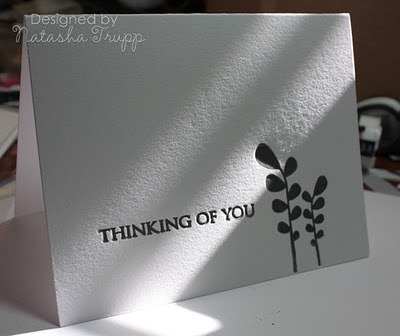 Your card is stunning in its simple elegance! .........THUD!!! Brilliant, Tash. Totally BRILLIANT!! !